I had a great time tasting Greek wines at Joe Saglimbeni’s last Tuesday. 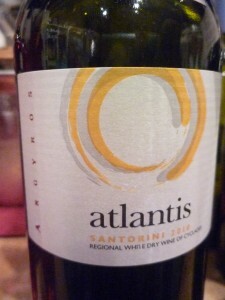 I’ll admit, I do not have much knowledge of Greek wines and did not know what to expect. The conclusion, though, was that I was pleasantly pleased. I was inspired by these new discoveries and decided to set forth time perusing the internet for more new discoveries – not those of wine, but those of Greek fashion designers. Again, not much knowledge here, and some of my research “wowed” me. Ceci wrote about this wine tasting earlier this week. You can reference her post here. 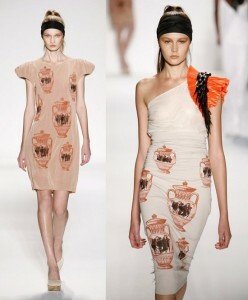 First, take a look at this Mary Katrantzou masterpiece. I was blown away by this. Again, wow! Stunning, fashion-foward, bold, vibrant, lively, fun, engaging! See full details on Ceci’s post. She describes this one as having ‘flirtatious acicity’ – I couldn’t agree more. I added a bottle of this to my collection. I also fell in love with Vasilios Kostetsos. Take a look at some of his amazing creations. 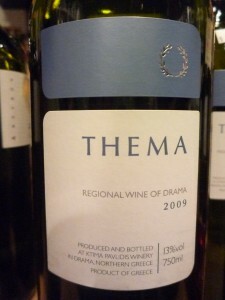 I would send this model down the runway with a glass of Thema in hand – from Drama, Greece. Drama indeed! (and look at those shoes)…. This enticing little number would be perfect with the Domaine Spiropoulos. I love new discoveries, and I thoroughly enjoyed this little Greek adventure! Next Next post: Let’s Talk Decor; Vinously Chic Decor Shall We? So happy to see you enjoyed Greek wines and I LOVE that you compared it to the hottest runway fashions – after all, drinking Greek wines is very FASHOINABLE right now.